Would you recommend Secret v11 to a friend? @chrismessina and what is the "obvious" difference? @OurielOhayon the most obvious one is that Secret uses your address book to make posts more relevant, whereas Yik Yak leans more heavily on location alone (Secret also offers a city-wide scope). 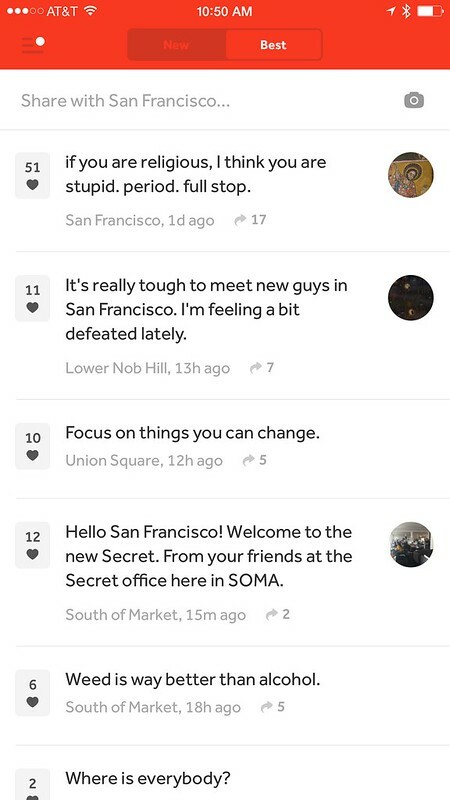 Secret also allows you to share to just your friend or to your city-neighbors minus your friends. I mean, clearly there are unmistakable visual similarities in the feed here, but the actual product definitions of each app are rather unique (given that they're in the same space). I've been thinking a lot about the role of originality and imitation recently. I loved David's vision for Secret as a product to help elicit positive conversations that people wanted to have but could not. (I actually wrote a research paper on this last semester). Sadly, I think this Secret has succumbed to imitation over originality. https://twitter.com/kylry/status... I wish this company the best. It looks like they have a great team of people who want to build a great product. I just wish they thought more about originality and just didn't give up and start imitating Yak. Which they clearly already have. @kylry This was really insightful and I completely agree with your points (which we have already talked about :P) Also, I want to read the research paper Kyle! Whoa, I was not expecting the re-brand. I really like the new positioning: "be curious". Emphasizes the positive / learning aspects of anonymous communication. It's also interesting that they moved away from a primarily dark aesthetic to something more colorful. Of course, what matters most is not branding but the product changes, but still I think this is a really smart move, and could get easily lost in the conversation about all the new features. @nbashaw the rebrand makes a lot of sense. The shadowed, black-and-white theme and stealthy fox logo was attractive, it may have sub-consciously inspired a more nefarious context than their new bright, cartoon-like fox. @jennyshen I noticed that, too. :) Personally I found a mixture of all kinds of secrets, from encouraging and supportive discussion (see screenshot in this essay I wrote) to hateful rumor-spreading. The latter is very hard to control but it's clear the Secret team is working on it (they have to if they're going to succeed). Hello all! I'm happy to share more insight into our new launch. There seems to be a lot of misinformation here. Secret was never about posting secrets. It's always been about giving people a safe place to say what's on their mind while keeping their privacy. AKA sharing secretly. The reason we moved away from large square photos with text on them is that they're unfortunately not conducive to conversation, which has been the most compelling part of Secret since day one. A stream with a lot of content is hard to consume one big square at a time, and we wanted to make it easier to read and write posts. Sharing a fleeting thought should be a lightweight experience, not a big event (which is what it felt like before). The background photos made a strong first impression, but ultimately it's the content within that makes the lasting impression, so we decided to focus on that. We launched Nearby at SXSW last year, but it was never fully implemented in the way we wanted until today. We knew people loved seeing posts around them, but it was muddled with posts from your social graph. We've also been piloting Secret for Work, which allows people to openly discuss ideas within their company. Finally, chat. This is something people have wanted since day one. Given all of these things, we set out to create an organizing principle and design that included all of the things we've learned and features we've wanted to launch. That is why you're seeing what you see today – a platform that brings transparency into communities with lasting value. @chrysb the name of the app is Secret... so it's not surprising that people would think that the app is for sharing secrets... but sure. 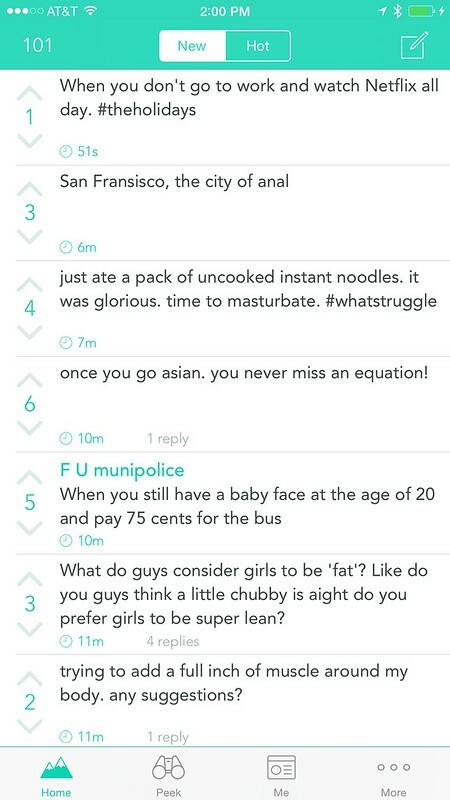 Can you say anything about engagement over time, or what you think about the comparisons to YikYak? 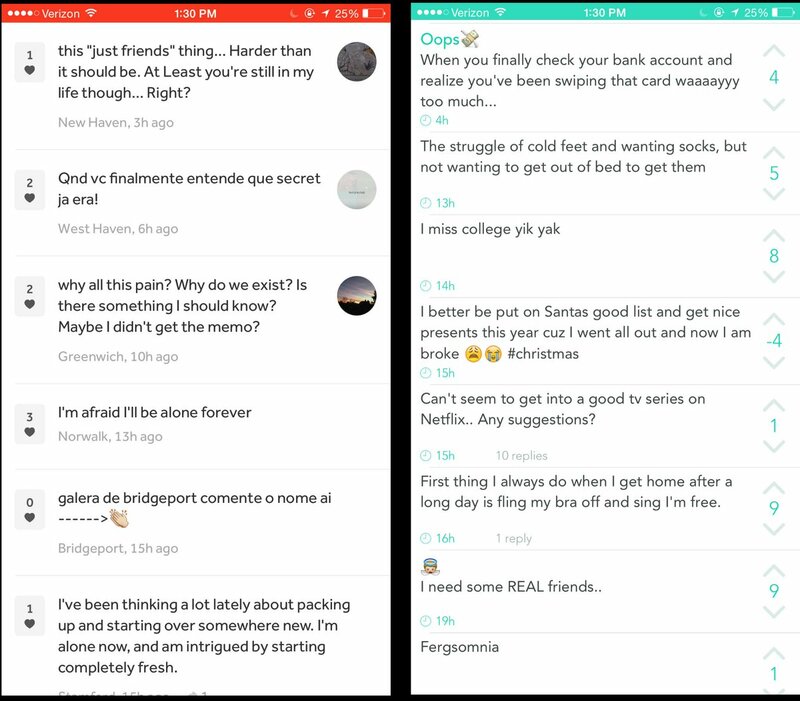 What other insights lead to the addition of private anonymous chat in the app? Clearly Anonyfish provided a third-party solution for that need — but went in the direction of a dating app. What kind of content do you expect people to chat about anonymously in the app, and what kinds of abuse controls do you have in place, compared with the protections you had in place for the public posts. Good questions, @chrismessina. @chrysb I'm curious to hear more about "Secret for Work". I remember when you launched Secret Dens, which was clearly an MVP for private/closed-group boards. Do you plan to build separate apps for these different experiences or will Secret provide multiple communities (split by location, social graph, company, etc.) within the same app? 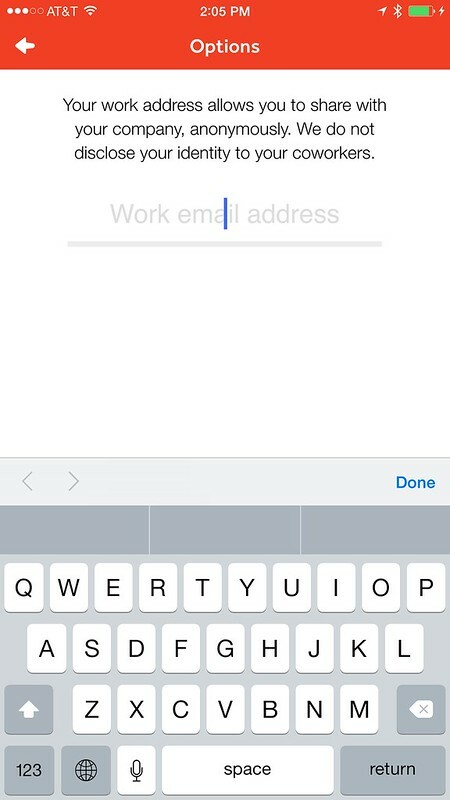 @chrysb @rrhoover you can already get the Secret for Work experience in the app. @chrismessina I missed that! I'm updating the app now. @chrismessina It’s easy to point out visual similarities, but you have to go deeper into product vision to understand the divergences. We are a communication platform that wants to bring transparency into communities. This release is just the first step. We have a lot we want to do with this in 2015. Secret is a place to discuss ideas openly in a way that’s ultimately useful and grounded in reality. 1:1 messaging is an important piece of that as it provides a special context to take conversations further. We've heard several stories of people reaching out to talk in more detail about personal challenges, health issues, similar interests, and yes, of course, flirtation. We're humans after-all :-) As for safety, you can always mute or leave a chat you're not interested in. We're watching how people use it and will make whatever changes necessary to ensure the best experience for everyone. @chrysb, @davidbyttow, and team just released a BIG redesign, most notably introducing private chat. @caseynewton has a great write-up on The Verge. The "anonymish" space has been fascinating to watch over the past year. Here's a collection of similar apps released in 2014. @chrysb @davidbyttow @caseynewton @rrhoover Would love to know the designer(s) who created this, love the UI!